These mozzarella stuffed meatballs are easy, comforting and healthy. Packed with delicious veggies and all made in the slow cooker, it couldn't be easier! There’s no need to heat up your oven or turn on your stove for these easy and healthy Slow Cooker Mozzarella-Stuffed Meatballs! While this delicious comfort food may look rich and cheesy, it’s actually a clean eating dinner that’s full of protein and vegetables for a nutritious and family-friendly dinner! I know that it might seem a little bit crazy to be sharing a hearty and cozy meatball recipe in the middle of the summer, BUT…listen up! 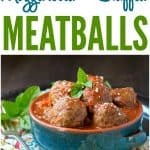 This is actually a lightened-up recipe that’s perfect for bathing suit season AND the meatballs and the sauce cook entirely in the slow cooker…meaning you don’t even have to heat up your oven on a hot day! Pretty genius, right? I actually can’t take all of the credit for this particular recipe. A very sweet reader named Julie shared it with me via email a few months ago after creating it for her fiancee. I tweaked Julie’s original recipe to make it even easier (I didn’t want to have to bake the meatballs or turn on a skillet before using the Crock Pot, and I lightened it up with some lean meat and loads of fresh veggies). To stuff the meatballs you need to mix all the ingredients together to make the meatballs apart from the mozzarella. To do this put everything in a bowl and gently massage everything together using your hands. Pick up a small amount of meatball mixture, flatten in your hand then add a cube of mozzarella and shape the meat around it to create a meatball. Repeat with the rest of the mixture. You’re going to love these meatballs served over pasta or zucchini noodles, or stuffed inside a hoagie roll. My family devoured them when I first served the meal, and we’ve enjoyed the leftovers again from the freezer. That’s right — I got TWO dinners from one effort (eat half now, freeze the other half for later), which is the true definition of efficiency! Thanks to Julie for this wonderful idea! 1 log 8 ounces fresh mozzarella cheese, or if you can find them I like to use the fresh mozzarella snacking cheese balls because they’re already shaped in exactly the right size – it’s an easy shortcut! Place vegetables (carrots, onion, bell pepper, and mushrooms) in bottom of slow cooker. In a large bowl, use hands to gently combine first 8 meatball ingredients (beef through Italian seasoning). Cut mozzarella into small cubes (about ½-inch diameter). Mold meat mixture around each piece of cheese to form round balls. 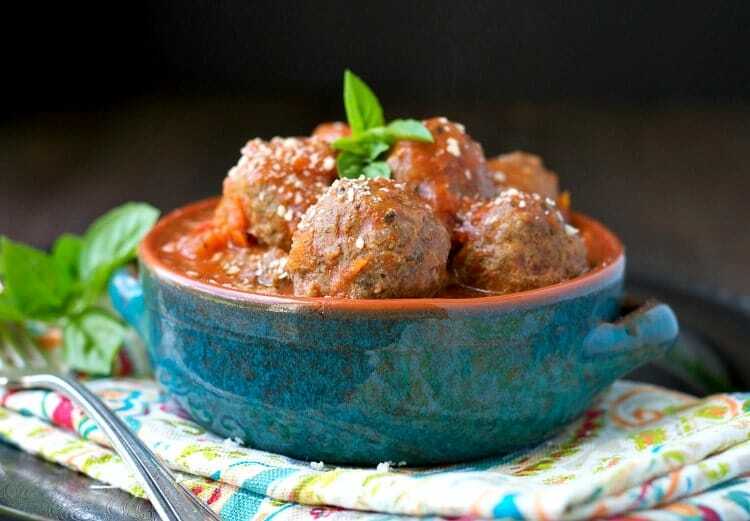 Place raw meatballs on top of vegetables in the slow cooker. In a separate bowl, combine tomato paste, broth, marinara, salt, oregano, and basil. Pour over meatballs. Cover and cook on low for 4-6 hours. Give everything a good stir and serve over pasta, zucchini noodles, or in hoagie rolls! These look sooooo good! I love it when feeding your family can still be healthy and delicious!! That shot where the cheese is stretching… oh my!! That’s the key, Kimber! Healthy, delicious, family-friendly! Thanks so much, friend! Whoa! 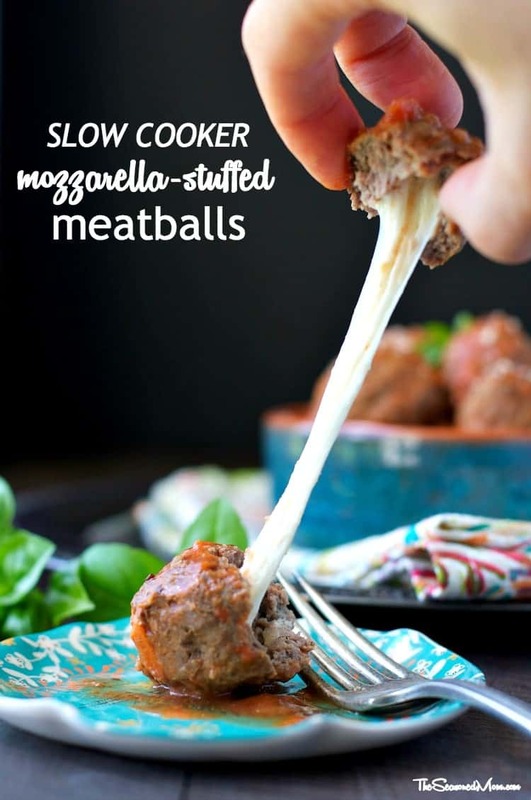 That melty cheese in the center of the meatballs has my mouth watering. Love this so much, Blair. Isn’t the slow cooker great? I want to make these for hubster!! Genius recipe, Blair! Kudos to you and Julie for teaming up to create something healthy, delicious and easy! Love it when readers contribute to the blog. 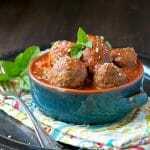 Meatballs are the best and I can’t wait to try this! Thanks so much, Robyn! You are SO kind! I hope that you enjoy the weekend as well! Ooooooh, that gooey cheese looks so so good! I NEED to try this! What a delicious recipe Julie shared! Hi, Kristy! Thanks so much! It’s a keeper!